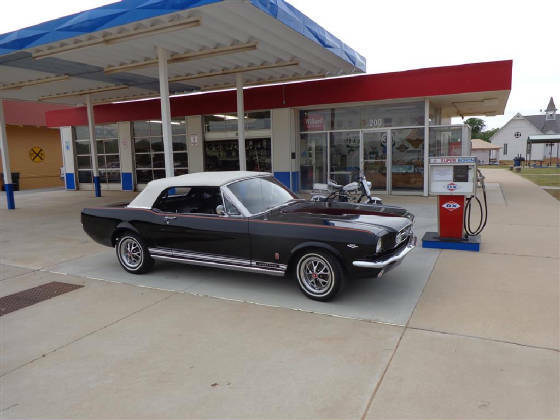 The ‘Great Oklahoma Classic’ for June 2014 is a 1966 Ford Mustang Convertible owned by James and Jeanie McDonald of Stillwater. 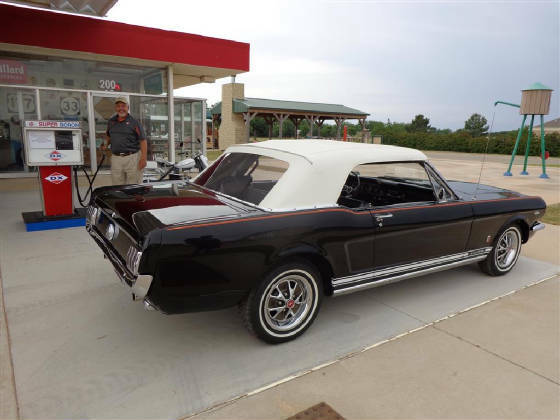 Recently James drove his classic Mustang to the Oklahoma Territorial Plaza and posed out front of the 1957 DX Gasoline Service Station Museum. 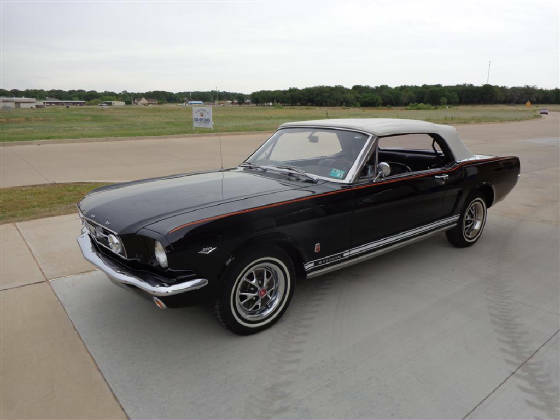 In 1982 while in Dallas, James spotted a 66 Mustang Convertible parked on the street outside the center field fence of his daughters Little League Softball game. He told his nephew who lived in Dallas Texas about it and with-in a week he sent James a Polaroid photo of a Mustang Convertible for sale in Dallas. 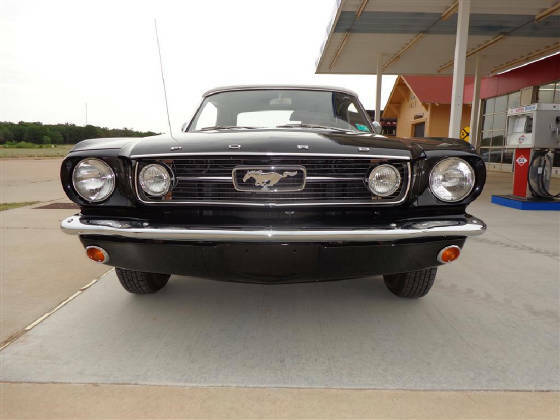 James flew to Dallas two days later with his wife Jeanie, their daughter Sarah and son Jay and bought the classic Mustang. While driving the classic and family back to Stillwater Oklahoma on Sunday afternoon, they stopped in Gainesville to add water to the radiator. They again stopped in Pauls Valley for bailing wire to reattach the muffler which was falling off. James took the Mustang to a local repair shop the following Monday morning and found out not only did the muffler need repair, but the rear brakes were not working. So began a thirty two year love affair between man and car. 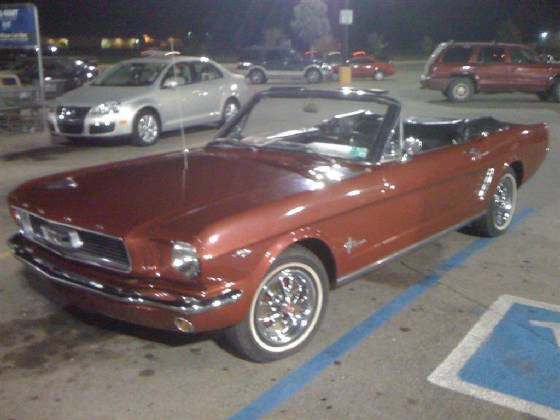 Two years later the Mustang was re-painted the original (almost) burgundy color. 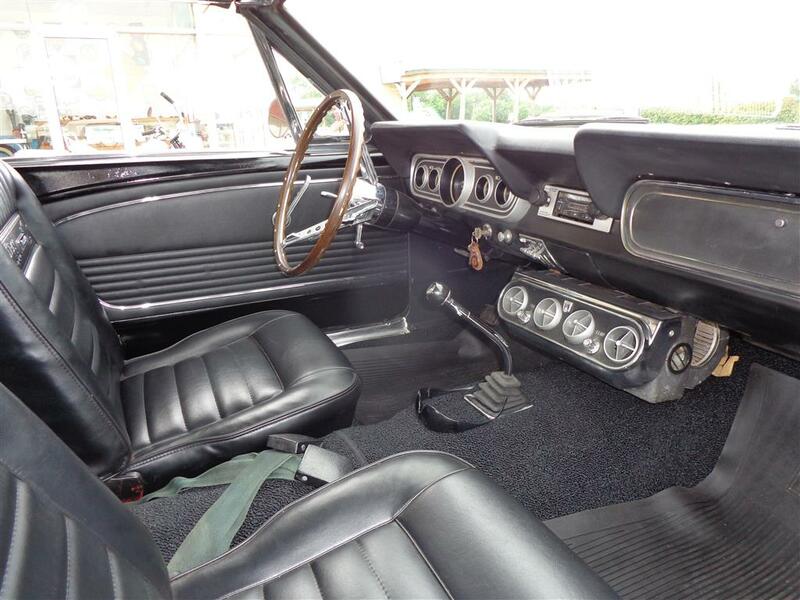 When James bought the classic it had an automatic transmission. He spent the next 30 years playing like it was a manual transmission by manually shifting from low to 2nd to drive as he would only drive to Sonic Drive-in on Sunday evenings and cruising around town. In 2011 James and Jeanie’s house was narrowly missed by a tornado but unfortunately a tree limb went thru the top of the Mustang. It was time for a change. Hagerty Insurance stepped up and paid for a new top and re-paint. James decided to make some changes to the Mustang. 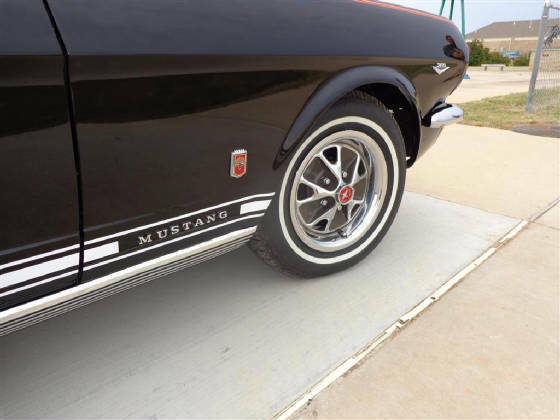 He changed the color completely; install a GT Package of striping, fog lights, 4 speed manual transmission, black Pony Interior, carpet, and a set of Styled Steel Wheels. James found out that in 1966, GT options were common but varied in options from dealer to dealer. 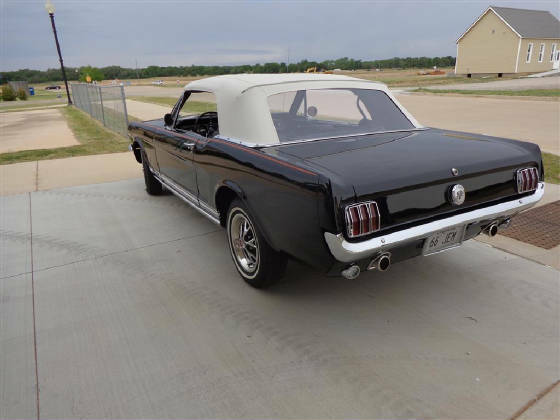 James recruited several very good restoration professionals to assist him with the total restoration of his classic 1966 Mustang convertible. Toby Ramsey of Ramsey Auto body of Stillwater painted and pin stripped the car with PPG Base Coat Black and a Clear Coat. 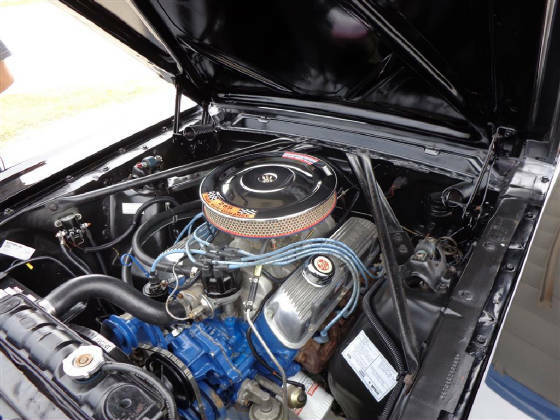 James had his long time friend and classic Ford expert Rick Kirk, RK Machine of Ripley Oklahoma to install a Borg Warner T10 4 speed transmission, Cobra Hi Rise manifold, Holley 4 BBL and repaint the engine. 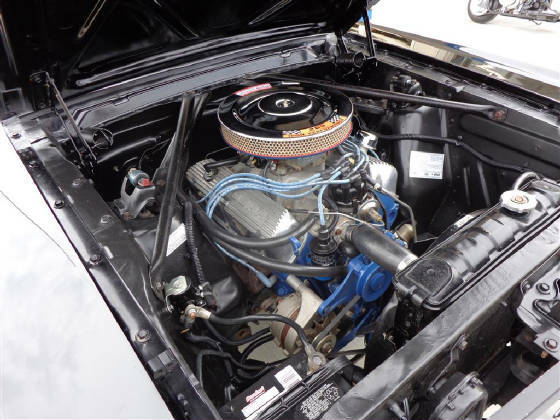 The 289 cubic inch V8 produces 225 horsepower at 4,800 rpms and 305 pounds feet of torque at 3,200 rpms. Bobby Dee’s Automotive Detail of Stillwater performed the final engine detailing and cleaning. 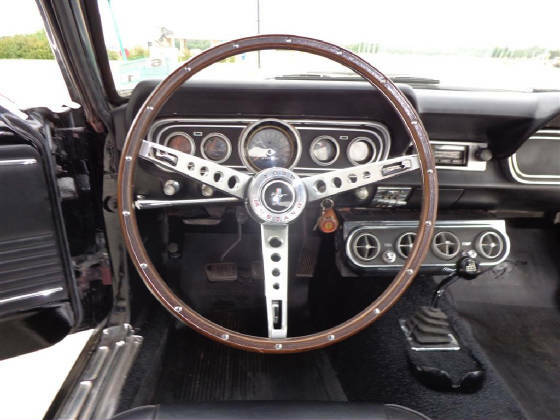 James wanted to keep that classic Mustang interior look. 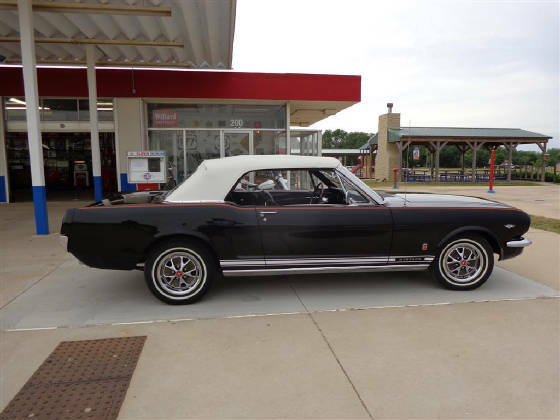 He worked with Sonny’s Auto Trim of Midwest City Oklahoma to install the new convertible top, Pony Interior and carpet. A classic restoration project is never complete. James removed the original compressor and will be adding a new compact vintage air compressor in the near future. The interior components for the air conditioning system are still in usable shape. 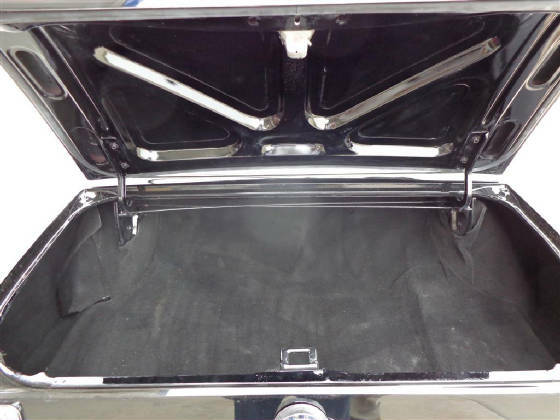 The trunk compartment has been restored and a new spare tire with cover will be added soon. 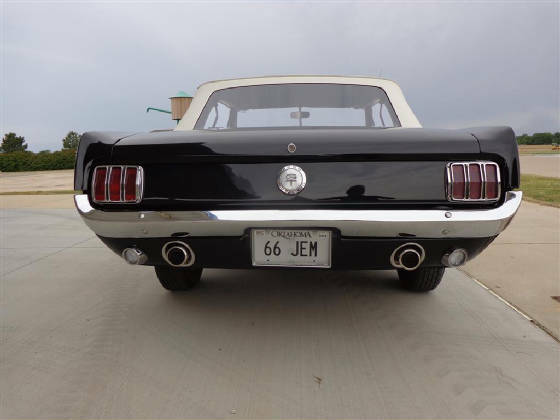 The Ford Mustang GT duel exhaust system, GT filler cap and the personalized auto tag look just right for this classic. Notice the pin stripping just happens to be Oklahoma State University Orange! As you can clearly see Toby Ramsey can paint a car! James used National Parts Depot of Ocala, Florida to provide most of the Ford GT component parts. An interesting bit of history; James’ father worked for Sunray DX Oil Company. 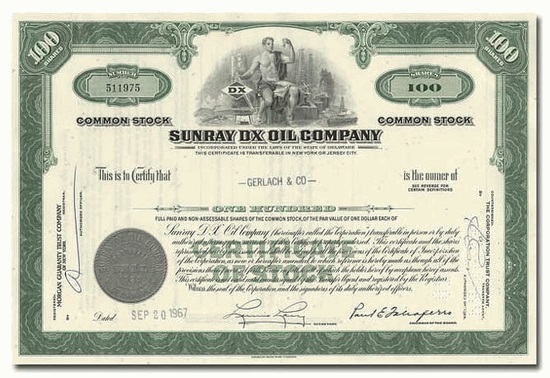 In 1965 Sunray DX was the sixth largest oil company in the world. The 1957 DX Gasoline Station at the Oklahoma Territorial Plaza was a DX Service Station for many years. Notice James holding the nozzle on the DX Super Boron pump! 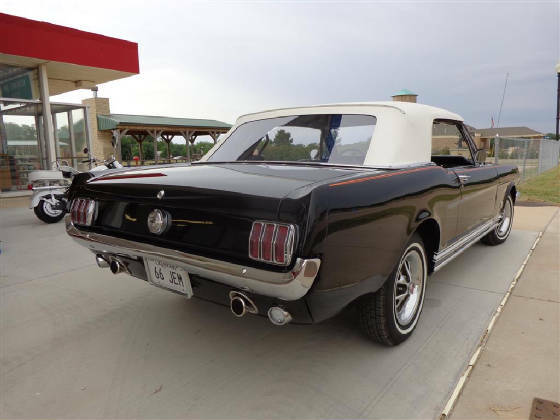 The Cimarron Starlite Cruisers sincerely appreciate James and Jeanie McDonald for sharing their outstanding 1966 Mustang Convertible as our Great Oklahoma Classic for June 2014!